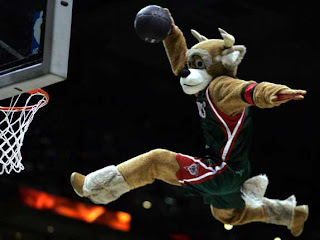 Bucks Grab the 6th Seed ~ The Bucky Channel - The World of Sports from Wisconsin's Perspective. Even Bango is flying high right now about the Bucks making the Playoffs. The Bucks beat the Celtics in their last game of the season to win 46 games on the year. The regular season was one that we should never forget, as the Bucks did things no one thought they would. The only problem is that was the regular season, and that's all thrown out the window. Now we must do it all again the Postseason. This is when you find out who has what it takes to win a NBA Championship. Andrew Bogut has been the player of the year for the Bucks this season. He will be missed in the playoffs, but I really feel that this team can give the Hawks a run for their money. The Hawks lead the season series against the Bucks 2-1, but none of the games were blow outs. All the games came down to the fourth quarter, and they were about who was going to step up in the clutch. One of the biggest things will be the Bucks bench going against a very good Hawks bench. Also Joe Johnson seems to bring his "A" game when he plays the Bucks, so lets hope he forgets that at home. Ridnour, Stackhouse, and Ilyasova played very well Wednesday night against the Celtics. These guys will be needed to play a role in for the Bucks to get past the Hawks. The playoffs schedule has been released, and we'll have an update on that later. Times and dates not withstanding, game one will be played in Atlanta, as will game two. Milwaukee will host the third and fourth games at the Bradley Center. If needed game five will be in Atlanta, and if game six is needed Milwaukee will host that one. Game seven if needed will be played in Atlanta. Not sure how many games this series will go, but I'm really excited to get things started. It should be a good one in the East, as I think the best eight teams got in. Another team I will be watching is the Charlotte Bobcats. They are a team that can get hot, and maybe shock the world. Do I really think they will beat the Magic, no, but they should give them a run. Also my boy LeBron better do work on the Bulls, because we here at the Bucky Channel don't like Chicago sports all too much. If you really want to check out the "B" squad game stats from Wednesday night click the link below. The Bucks beat the Celtics 106-95, with Luke Ridnour grabbing the Bucks Player of the Game. The Player of the Game standings will continue through the playoffs, going of the standings that have already been established. In case you were wondering.